Fluorosis stains are characterized by white or brown spots on the teeth, creating a mottled appearance. See the photographs on the right. They are caused from the consumption of too much fluoride while the teeth are forming. Fluoride occurs naturally in most water supplies, but it is rarely at optimal levels. When water contains one part per million of fluoride, the teeth have extra resistance to tooth decay but have a normal appearance. So communities will usually set up a treatment facility to adjust the amount of fluoride in the water. Usually this amounts to adding fluoride, but in some cases it means taking some out. 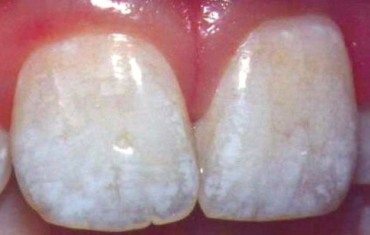 If the spotting is white and not too objectionable, it may be wise to wait until the late teens or early twenties to treat the fluorosis stains. White spots have been known to sometimes fade with time, as the enamel matures. Plus, treatment that is done before the teeth are fully erupted will need to be re-done in the patient’s teens. Brown fluorosis stains, however, will not go away, and may need to be treated sooner. There are a couple of treatment options, depending on the extent of the stain. The website animated-teeth.com recommends teeth bleaching for fluorosis. However, this will not work, and can actually sometimes make the teeth look worse. It whitens the teeth uniformly, and can make spotting more noticeable. Limited spotting can be treated with direct dental bonding. The stains are ground out by removing maybe half a millimeter or less of the stained enamel—however much is needed. This stained enamel is then replaced with dental bonding composite which is carefully matched to the shade, translucency, and texture of the surrounding enamel. The result, when this is done well, is beautiful and the repair is undetectable. If the spotting is more extensive and the enamel has assumed a general brownish or yellowish color, then the whole tooth will need to be covered with a porcelain veneer. 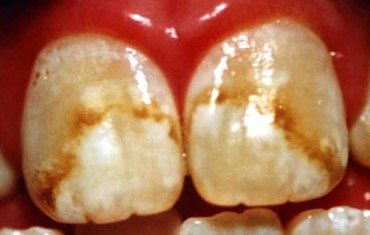 At What Age Should Fluorosis Stains Be Treated? There is no minimum age for receiving dental bonding. Permanent teeth begin to erupt around age six or seven, and that is old enough to be able to sit still for these delicate cosmetic dentistry treatments. Porcelain veneers should be delayed until the teeth are fully erupted, which would be during the teen years. This is to ensure that the entirety of the stains are covered. There is also a judgment factor balancing the self-esteem of the child who may be troubled by terribly spotted teeth against the timing of when to treat teeth that will not be fully erupted until the teen years. I strongly recommend consulting with an experienced cosmetic dentist for these treatments. Not only do these services require highly specialized training and artistry that isn’t possessed by most general dentists, but my experience tells me that only dentists who are passionate about appearance-related dentistry will fully understand and appreciate the issues involved.